The calendar gives us a few more weeks but the weekend temperatures say summer has arrived. Yesterday we waited for the temperature to rise and then set off to walk downtown. We took a longer than normal route to avoid a long trudging type hill and for variety. 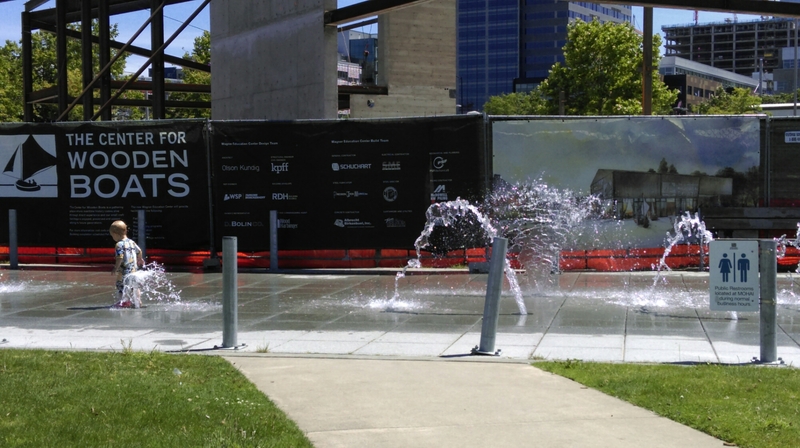 Stopped by MOHAI for peppers and watching kids play in the water park. This little boy was trying the bidet approach. We also watched the slalom and foot plug approaches to the fountains. On through South Lake Union where we happened upon a graduation ceremony for the Seattle campus of Northeastern University. In a window. Or at least a room with windows to the world. Finally at the stadium with our small clear bag of food, wallets, phones and a few sandwiches. Up to our seats. In the sun. 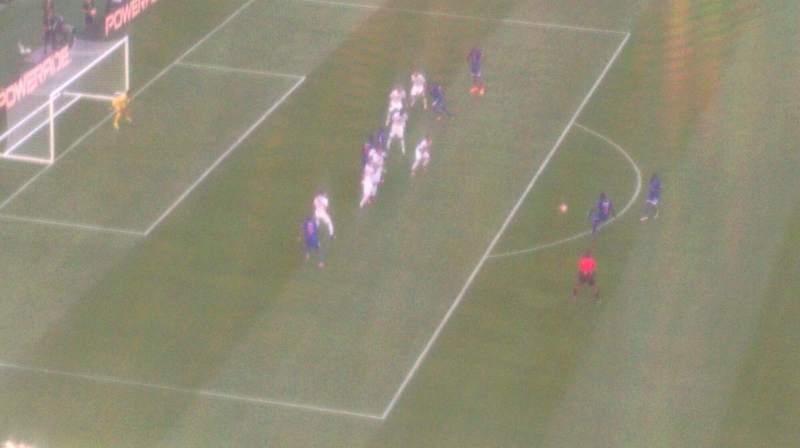 This was a free kick for Haiti (in blue). Peru won 1-0. The game was entertaining, even though Captain Obvious sitting behind us was a bit annoying. Today is even hotter than yesterday, probably in the 90s. 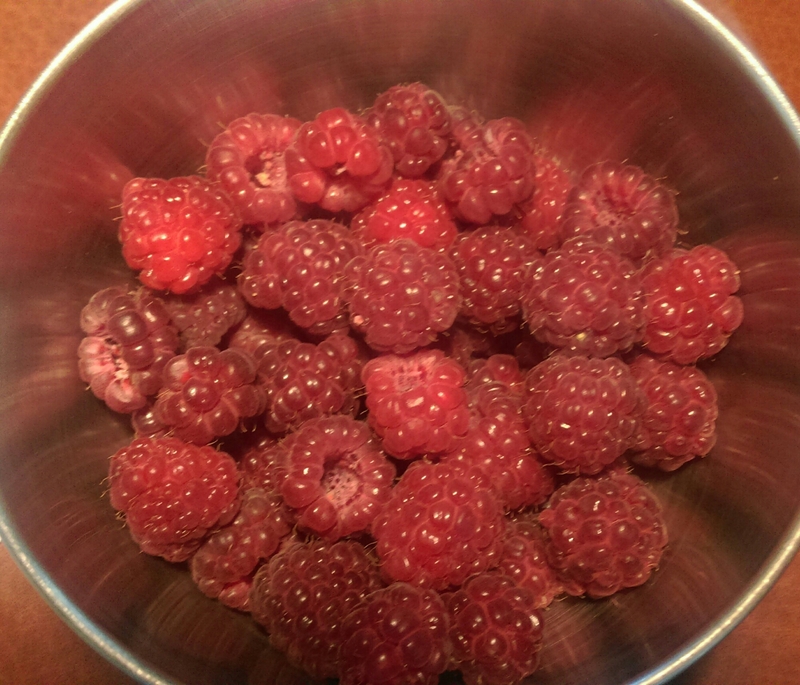 Carl did some yard work, and I did my small part around the raspberries. Including the first harvest of the year. This entry was posted on June 5, 2016 at 3:54 pm and is filed under Uncategorized. You can follow any responses to this entry through the RSS 2.0 feed. You can skip to the end and leave a response. Pinging is currently not allowed. I love the radiating reflections of the raspberries! Also, a new post. Bidet approach–HAHA! Love it! I’m enjoying the cooler temperatures. Running (and sleeping) in 90 plus weather are miserable.